President Obama was in New York last night for three fundraisers. 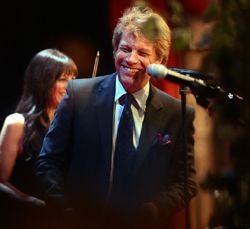 Jon Bon Jovi, who attended all three and headlined the event at the Waldorf, was the President's guest on the Air Force One flight from Washington, DC to New York and back at the end of the evening. Some people (Obama) get all the luck.